Objective: To evaluate the conversion of opioid-experienced patients with chronic moderate-to-severe pain to extended-release morphine sulfate with sequestered naltrexone hydrochloride (MSN) using a standardized conversion guide. Methods: This open-label, single-arm study was conducted in 157 primary care centers in the United States. A total of 684 opioid-experienced adults with chronic moderate-to-severe pain were converted to oral administration of MSN from transdermal fentanyl and oral formulations of hydrocodone, hydromorphone, methadone, oxycodone, oxymorphone, and other morphine products using a standardized conversion guide. The primary endpoint was the percentage of patients achieving a stable MSN dose within a 6-week titration phase. Secondary endpoints included duration of time to stable dose, number of titration steps, safety and efficacy measures, and investigator assessment of conversion guide utility. Results: Of the 684 patients, 51.3% were converted to a stable dose of MSN (95% confidence interval: 47.5%, 55.1%). The mean (standard deviation) number of days to stable dose was 20 (8.94), and number of titration steps to stable dose was 2.4 (1.37). The majority of adverse events were mild/moderate and consistent with opioid therapy. Mean pain scores at stable dose decreased from baseline. Investigators were generally satisfied with the conversion guide and, in 94% of cases, reported they would use it again. Conclusion: Conversion to MSN treatment using the standardized MSN conversion guide was an attainable goal in approximately half of the population of opioid-experienced patients with chronic moderate-to-severe pain. Investigators found the guide to be a useful tool to assist conversion of opioid-experienced patients to MSN. Opioids are an established therapeutic tool for the relief of moderate-to-severe pain.1,2 Over the last two decades, opioid use has expanded from the treatment of acute postoperative pain and terminal cancer pain to include the treatment of chronic, noncancer pain (CNCP).3,4 While the evidence for the long-term efficacy of opioid therapy in treatment of CNCP remains variable,5 an increasing number of patients are prescribed opioids for CNCP.6 In a recent meta-analysis of clinical trial evidence for long-term effectiveness and safety of opioid treatment in CNCP, Noble et al7 reported that 32.5% of patients did not continue long-term oral opioid treatment due to intolerable adverse effects, whereas 11.9% discontinued because of insufficient pain relief. Finding an appropriate balance between analgesic efficacy and tolerable side effects is a critically important and often complex task for physicians when managing patients on long-term opioid therapy. Opioid tolerance, characterized by the reduced efficacy of opioids following repeated dosing, may lead to upward titration of dose to achieve adequate pain relief, often resulting in an increase in deleterious side effects. When dose alterations no longer provide for adequate pain control or elicit intolerable side effects, opioid conversion is indicated8–11 or discontinuation of opioid treatment. Opioid conversion (often used interchangeably with “rotation” or “switching”12) has been defined as a change in opioid drug or route of administration with the goal of improving outcomes.13 The mechanisms by which opioid conversion is thought to promote changes in either pain control or side effects are hypothesized to be the incomplete cross-tolerance between opioids, reducing the opioid load (incomplete tolerance) and/or side effects, and individual variation in opioid pharmacodynamics and pharmacokinetics.10 The variable response of individuals to opioids presents challenges to physicians when converting from one opioid to another. Conversion requires knowledge of how to safely transfer patients between opioid formulations and careful consideration of a dose and titration plan for each individual patient, regardless of prior opioid.10,14 Equianalgesic tables have long been used to translate relative opioid potency data into a form useful for clinical decision making regarding opioid conversion. The limitations of equianalgesic tables are well known9,15–17 and stem from acknowledgment that the relative potency data from which they are derived are weak, often from single-dose studies involving acute pain in healthy opioid-naïve patients.8 Nevertheless, the equianalgesic table remains an important first resource to guide physicians in the design of a safe and effective opioid conversion regimen for an individual patient. The MSN conversion guide (Supplementary materials) summarizes published equianalgesic data to specifically assist health care professionals in converting patients to MSN from transdermal fentanyl and oral formulations of commonly used opioids, ie, hydrocodone, hydromorphone, methadone, oxycodone, oxymorphone, and other morphine products. The equianalgesic dosing data in the MSN conversion guide (Table 1) are derived from the equianalgesic table published in 2003 by the American Pain Society22 with additional conversion information for hydrocodone,23 oxymorphone,24 and transdermal fentanyl.25 The guide recommends a 50% reduction in calculated equianalgesic dose as a suggested starting dose for MSN and does not specify a maximum dose. The guide does not contain information for parenteral opioid dose conversion to MSN and is not intended for reverse conversions. Note: All conversions based on 30 mg morphine PO. Abbreviations: APS, American Pain Society; MSN, extended-release morphine sulfate surrounding sequestered naltrexone hydrochloride; OM, oxymorphone; PO, per oral; Trans, transdermal. There is a need for studies that involve “real-life” clinical settings to better characterize conversion experiences in patients with chronic moderate-to-severe pain.12 The purpose of this study was to evaluate the success of converting opioid-experienced adults with chronic moderate-to-severe pain from a range of commonly prescribed opioids to MSN, using the MSN conversion guide (Supplementary materials) in a primary care setting. This study reports clinically relevant conversion information, including the number of titration steps and time to achieve a stable dose of MSN, efficacy and AE analyses, and an investigator assessment of the utility of the MSN conversion guide. This open-label, single-arm, multicenter study was conducted at 157 primary care centers in the United States from August 27, 2010, to March 10, 2011, when the study was terminated early due to a voluntary sponsor recall of MSN that related to a prespecified manufacturing stability requirement not being met during routine testing (ClinicalTrials.gov: NCT01179191). MSN is expected to be available again in 2015. This study was conducted in accordance with the Good Clinical Practice requirements described in the current revision of the International Conference on Harmonisation of Technical Requirements of Pharmaceuticals for Human Use Guidelines. All local regulatory requirements were followed, and all participants gave written informed consent prior to entering the study. Eligibility for the study included patients aged ≥21 years with chronic (≥3 months) moderate-to-severe pain who required around-the-clock opioid treatment for optimal analgesia. All patients were opioid-experienced, defined as taking a daily opioid for at least 30 days prior to screening (excluding tramadol and/or ER morphine products) and able to be safely converted to a minimum morphine dose of 20 mg/day. Patients were recruited according to type of opioid specified in the MSN conversion guide; the following commonly used opioids were represented in the study population: transdermal fentanyl, immediate-release (IR) hydrocodone, IR hydromorphone, IR oxycodone, IR morphine, methadone, ER oxycodone, or ER oxymorphone. Patients were excluded if they were diagnosed with and/or exhibited signs or symptoms of opioid and/or alcohol abuse, or were participating in and/or seeking treatment for opioid and/or alcohol abuse. Patients with a documented history of allergy or a clinically significant intolerance to morphine, morphine salts, naltrexone, or other opioids, such that treatment with morphine was contraindicated, were also excluded. Women who were pregnant, lactating, or planning to become pregnant during the course of the study were not eligible. The study comprised three phases: screening, titration, and maintenance (Figure 1). Screening consisted of a single visit (Visit 1) during which standard medical screening to determine eligibility took place. During this visit, consenting patients completed a baseline Brief Pain Inventory (BPI)26 and a confidential Self-Reported Misuse, Abuse, and Diversion (SR-MAD) questionnaire. (Data from SR-MAD are published separately in this volume.) During the titration stage, lasting up to 6 weeks, all patients were converted to MSN. Conversion to MSN was standardized for all investigators using the MSN conversion guide provided with the protocol (Supplementary materials). However, the conversion guide instructions indicated that the actual dose should be based on clinical judgment and adjusted on an individual basis. The selection of the initial dose of MSN for each patient was based upon the following considerations and information: 1) the total daily dose, potency, and type of opioid the patient had been taking previously; 2) the reliability of the relative potency estimate used to calculate the equivalent dose of morphine needed (potency estimates may vary with the route of administration) to replace the patient’s opioid; 3) the type and severity of the patient’s pain; 4) the patient’s degree of opioid experience and tolerance; 5) the general condition and medical status of the patient; and 6) the patient’s concomitant medications. A stable dose was defined by all of the following criteria: 1) a dose that has been taken for at least 48 hours; 2) a dose that the investigator deemed had achieved the balance between an acceptable level of analgesia and/or function, and tolerance of side effects; and 3) a dose that allows for rescue medication use of no more than two doses per day. At the discretion of the investigator, rescue medication was allowed so as to provide supplemental analgesia for breakthrough pain during titration; rescue medications included IR morphine (<20% of the total daily dose of MSN per IR dose), ibuprofen (up to 400 mg/dose, not to exceed 1,200 mg/day), and acetaminophen (up to 1,000 mg/dose, not to exceed 4,000 mg/day). 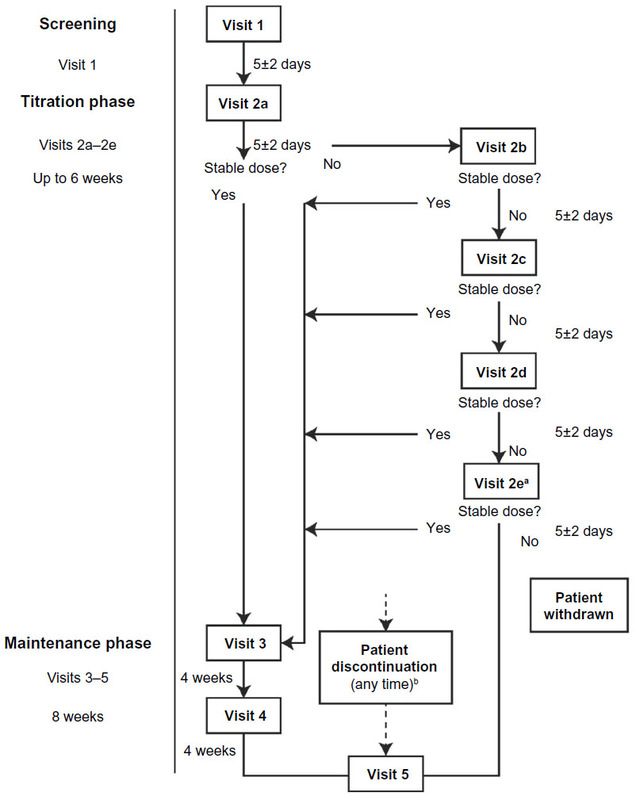 Subsequent visits (Visits 2b–e) were optional if the patient required additional dose adjustments, and occurred every 5 days (±2 days) following the previous visit to a maximum of 6 weeks. If a patient did not achieve a stable dose by 6 weeks, he or she was discontinued from the study. Patients who achieved a stable MSN dose returned to the clinic for Visit 3 and completed a BPI. At this visit, the investigator completed a conversion assessment survey, a brief questionnaire using multiple choice options and an 11-point numeric rating scale (NRS) with specified anchored responses, ranging on a scale from 0 (not useful) to 10 (very useful). During the maintenance stage, lasting 8 weeks, patients completed a BPI (Visits 4 and 5) and women underwent a urine pregnancy test (Visit 5 only). Notes: aIf a patient completes Visit 2e prior to day 42 but has not achieved a stable (effective) dose of MSN, titration visits could continue as unscheduled visits until day 42; bpatients who discontinued at any point in the study were to complete Visit 5 as the final visit. Abbreviation: MSN, extended-release morphine sulfate surrounding sequestered naltrexone hydrochloride. All patients who filled a prescription for MSN were defined as the safety population. All AEs were coded to System Organ Class and Preferred Term (using MedDRA® version 13.1). Treatment-emergent AEs (TEAEs) were defined as AEs that commenced after the patient filled the first MSN prescription, and were categorized by incidence, intensity, relationship to study drug, and seriousness of TEAE. The study was designed to enroll up to 1,300 patients with approximately 160 patients from each of eight types of commonly prescribed opioids. With 1,300 patients total and 160 patients per opioid type, the 95% confidence interval (CI) of conversion success rate would have a 5% and 15% width, respectively, assuming a success rate of 30%. Results were presented graphically and with summary statistics. Exact CIs were calculated for the primary endpoint. Due to early termination of the study, the desired enrollment of up to 1,300 patients was not achieved. A total of 684 patients constituted the safety population and comprised 378 (55.3%) women with a median age of 52 years (range, 21–90), and predominantly white (83.3%) or African American (12.6%). 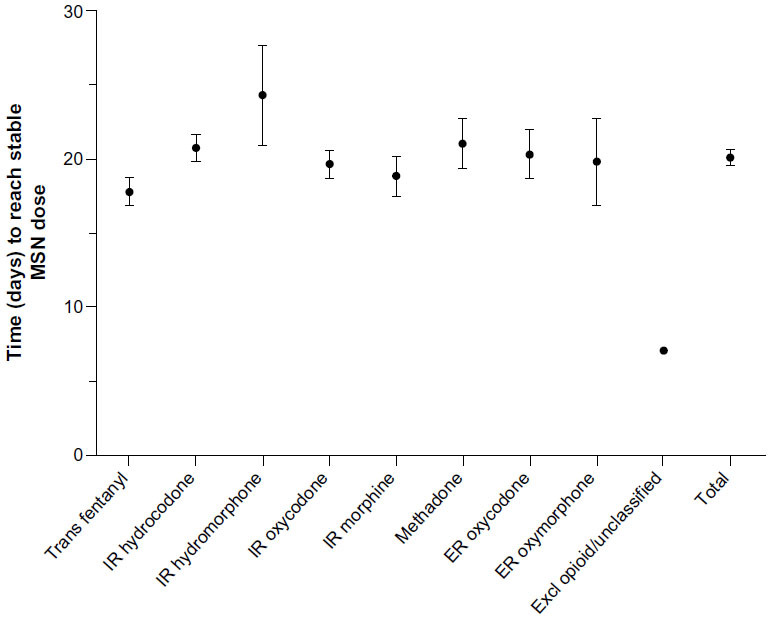 Prior opioid types were IR hydrocodone (n=164, 24.0%), IR oxycodone (n=160, 23.4%), ER oxycodone (n=107, 15.6%), transdermal fentanyl (n=77, 11.3%), methadone (n=64, 9.4%), IR morphine (n=53, 7.7%), ER oxymorphone (n=25, 3.7%), IR hydromorphone (n=22, 3.2%), and excluded opioid/unclassified (n=12, 1.8%). Primary pain classifications were musculoskeletal (55.1%), arthritis (23.9%), and nerve-related pain (10.7%). Most patients (95.1%) had experienced primary pain for more than 1 year, 57.4% for more than 5 years, and 32.1% for more than 10 years. No clear differences in patient demographics were observed among subgroups of prior opioid types. Of the safety population, 351 patients (51.3%) achieved a stable dose of MSN with the 6-week titration stage (95% CI: 47.5%, 55.1%). 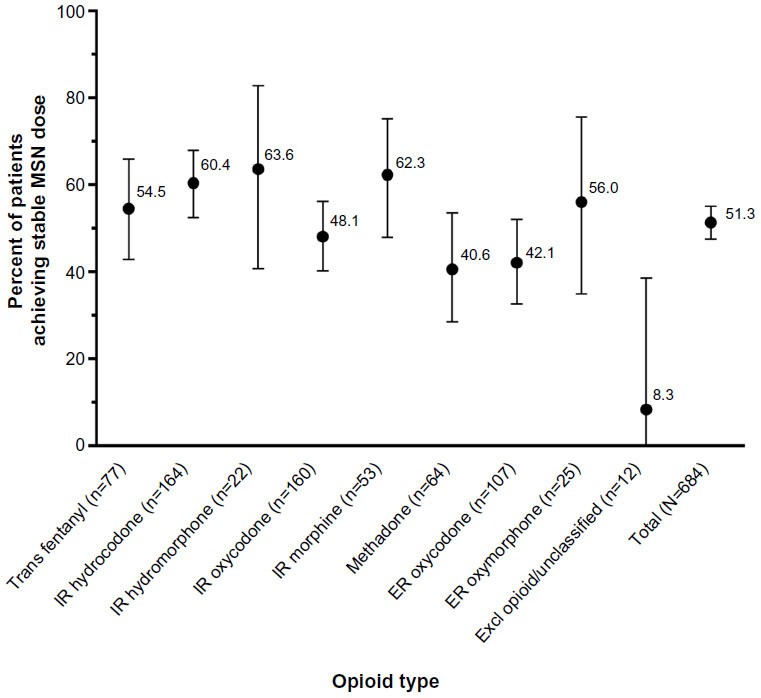 When stratified by previous opioid treatment, a stable dose was achieved by 40.6% of patients who had used methadone, 42.1% who used ER oxycodone, 48.1% who used IR oxycodone, 54.5% who used transdermal fentanyl, 56.0% who used ER oxymorphone, 60.4% who used IR hydrocodone, 62.3% who used IR morphine, and 63.6% converting from IR hydromorphone (Figure 2). The most frequent reasons for discontinuation during titration were patient decision (n=162), other, including patients who discontinued due to early discontinuation of the study (n=62), and AEs resulting in study drug discontinuation by physician (n=45). For the 162 patients whose reason for discontinuation during titration was patient decision, the most frequent reasons specified were AE tolerability (n=66) and perceived lack of efficacy (n=63). Only 13 patients were withdrawn due to failure to reach a stable dose during titration. Figure 2 Frequency (%) of patients achieving stable MSN dose by opioid type. Note: Data are percent ±95% confidence interval. Abbreviations: ER, extended-release; Excl, excluded; IR, immediate-release; MSN, extended-release morphine sulfate surrounding sequestered naltrexone hydrochloride; Trans, transdermal. The mean (standard deviation, SD) number of days to a stable dose of MSN was 20 (8.94), ranging from 17.8 days in patients whose prior opioid was transdermal fentanyl to 24.3 days in patients whose prior opioid was IR hydromorphone (Figure 3). The mean (SD) number of steps (ie, dose adjustments) during titration to a stable dose was 2.4 (1.37), ranging from 2.0 steps in patients whose prior opioid was transdermal fentanyl to 2.7 steps in patients whose prior opioid was methadone (Figure 4). The median MSN starting dose was 40 mg/day (range, 20–400 mg/day), and the median stable dose was 80 mg/day (range, 20–1,200 mg/day). Of the 351 patients who achieved a stable dose, 95.4% reported using rescue medication at least once during titration. The percentage of patients who reported an average of three or more rescue medication uses per day was 61.6% at baseline and 22.0% at Visit 3 (stable dose). Figure 3 Number of days to reach stable MSN dose by prior opioid. Note: Data are mean ± standard error. Figure 4 Number of steps to reach stable MSN dose by prior opioid. At Visit 1, the mean (SD) pain score (average pain in the past 24 hours) was 6.3 (1.79) and ranged from 5.5 (2.00) in patients converting from methadone to 6.85 (1.63) in patients converting from IR hydromorphone. Mean pain scores decreased from baseline to stable dose. Overall, at baseline (all patients) and at stable dose of Visit 3 (only patients achieving stable dose), respectively, the mean average pain (SD) was 6.3 (1.79) and 4.0 (2.11); mean least pain (SD) was 4.6 (2.27) and 2.7 (2.01); and mean worst pain (SD) was 8.0 (1.64) and 5.5 (2.37). 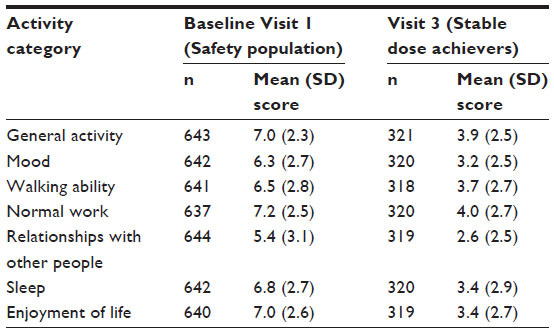 In Figure 5, mean pain ratings are shown alongside mean MSN dose for those patients who achieved a stable dose (Figure 5A) and those who did not achieve a stable dose (Figure 5B). Patients who converted to MSN reported lower pain interference over the 24 hours prior to Visit 3 compared with baseline for all patients, for all activity categories (Table 2). The patients who failed to convert showed persistently higher pain scores despite increasing doses of opioid. 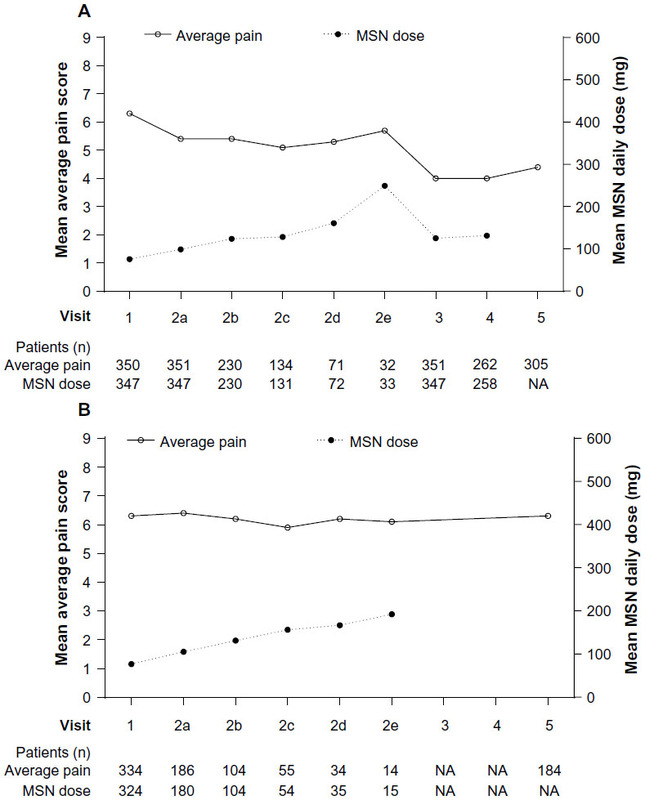 Figure 5 Mean average pain score and mean MSN daily dose in (A) patients achieving a stable MSN dose, and in (B) patients who did not achieve a stable MSN dose. Notes: Number of patients at each visit is not constant. Visits 2a to 2e, titration phase up to 6 weeks; Visits 2b to 2e were optional, used by subjects not on a stable dose at previous visit up to 6 weeks. Abbreviations: MSN, extended-release morphine sulfate surrounding sequestered naltrexone hydrochloride; NA, not available. Abbreviations: MSN, extended-release morphine sulfate surrounding sequestered naltrexone hydrochloride; SD, standard deviation. Initiation of MSN therapy at the dose calculated by the conversion guide occurred in 30.3% of patients and varied markedly among subgroups of prior opioid types, ranging from 5.3% in patients converting from transdermal fentanyl to 54.1% in the group converting from IR hydrocodone. Approximately one-half (56.3%) of patients received a starting MSN dose above the conversion guide calculation, ranging from 36.9% of patients converting from IR hydrocodone to 92.0% of patients converting from transdermal fentanyl. Only 12.4% of patients received a starting dose lower than the conversion guide calculation, ranging from 0% of patients converting from IR hydromorphone to 25.4% of patients converting from methadone. In the safety population, 343 patients (50.1%) reported at least one TEAE. The most frequent TEAEs (>5% of patients) overall and by prior opioid are shown in Table 3. The total number of patients who discontinued due to TEAEs was 153 (22.4%). Discontinuation based on prior opioid treatment ranged from 13.6% in patients converting from IR hydromorphone to 28.0% in patients converting from ER oxymorphone. The most frequent TEAE cited for discontinuation was nausea in 26 patients (3.8%), constipation in 22 (3.2%), headache in 15 (2.2%), vomiting in 13 (1.9%), and somnolence in 12 patients (1.8%). The majority of TEAEs were mild or moderate. The most frequent severe TEAEs were constipation in 13 patients (1.9%); nausea, vomiting, and pain reported in seven patients (1.0%) each; and headache and insomnia each reported by three patients (0.4%). AEs reporting verbatim the term withdrawal were reported by two patients. A total of 24 (3.5%) patients reported at least one serious AE, with 35 events in total. The most frequently reported serious AEs were constipation, nausea, and dehydration, each reported for two patients (0.3%). Serious AEs occurred in patients across all subgroups of prior opioid types; the majority were not considered related to MSN. Two deaths were recorded during the study. A 35-year-old woman was determined to have died from adult respiratory distress syndrome from an uncommon inflammatory process that resulted in diffuse alveolar damage by day 27 of MSN treatment. Another patient, a 77-year-old woman with a history of chronic obstructive pulmonary disease (COPD), died at home after study completion following worsening COPD after 84 days of MSN treatment. Both deaths were determined by investigators not to be reasonably attributable to MSN. Note: An adverse event is defined as treatment emergent if it has a start date/time at any point after the patient filled the initial MSN prescription. Abbreviations: ER, extended-release; IR, immediate-release; MSN, extended-release morphine sulfate surrounding sequestered naltrexone hydrochloride; Pts, patients; TD, transdermal; TEAE, treatment-emergent adverse event; Unclassif, unclassified. A conversion assessment questionnaire was returned by the investigators for 352 patients at Visit 3. Investigators were generally satisfied with the MSN conversion guide, and found it clear, useful, and easy to use (Table 4). Of 350 responses, in 255 (72.9%) cases the investigators agreed with the starting dose of MSN calculated by the conversion guide. Of 95 cases (27.1%) where the investigator did not agree with the starting MSN dose, the calculated starting dose was cited as too low in 88 (92.6%) instances. Overall, in 329 (94.0%) cases, investigators reported that they would use the MSN conversion guide again. Notes: aScale from 0 (not useful) to 10 (very useful); bscale from 0 (very difficult) to 10 (very easy); cscale from 0 (very unclear) to 10 (very clear); dscale from 0 (very dissatisfied) to 10 (very satisfied). This study provides clinically useful information regarding the utility of the MSN conversion guide in assisting in the safe conversion of opioid-experienced patients to MSN in a primary care setting. Opioid conversion is a common strategy employed in the management of patients on chronic opioid therapy and is used primarily to mitigate either a reduction in analgesic efficacy or an increase in intolerable side effects.9 With the variety of opioids currently available, opioid conversion can be a challenging clinical process, and successful conversion is greatly assisted by the use of simple, clear, and concise conversion guides. Studies have demonstrated that opioid rotation can result in restoration of pain control in both cancer patients30–33 and those with CNCP.34–36 Patients who achieved a stable MSN dose (Visit 3) reported a clinically significant reduction in mean average pain scores from baseline based on a reduction of ≥2 points on the NRS.37 This supports existing data reporting the analgesic efficacy of MSN for chronic moderate-to-severe pain12,18–20 and data reporting analgesic efficacy of ER morphine sulfate formulations.38 Pain scores remained elevated in patients who did not achieve a stable dose, and the magnitude of pain relief experienced by the majority of those who achieved a stable dose was consistent with that previously reported.12 This suggests that inadequate pain control may be a risk factor for not achieving conversion. A fifth of patients who investigators determined as achieving a stable MSN dose reported ≥3 rescue medication uses per day. While the study protocol defined a stable MSN dose as ≤2 uses of rescue medication per day, determination of whether a patient achieved a stable MSN dose also took into account a clinical judgment of an appropriate balance between analgesia and side effects. Most investigators agreed with the starting dose as calculated by the MSN conversion guide; however, of those who did not agree, nearly all felt the calculated starting dose was too low. Interestingly, while in 72.9% of cases investigators agreed with the starting dose calculated by the MSN conversion guide, only 30.3% of patients received this starting dose. Actual starting dosages of MSN were predominantly greater, but a minority was also lower than those calculated by the MSN conversion guide. The starting dose of MSN in the conversion guide is suggested to be 50% of the calculated equianalgesic dose. The guide recommends a reduced initial dose and upward titration, supplying breakthrough medication to address incomplete analgesia to avoid overestimation requiring management of an AE.21 This dose adjustment is at the upper end of the suggested 25%–50% safety factor range identified as best practice for opioid rotation.13 In more than half of patients in this study, clinical judgment determined that a drop of 50% below the equianalgesic dose was not warranted. This variation of the MSN starting dose from the suggested dose merely serves to highlight the critical importance of individualized clinical assessment and physician knowledge of specific patient history and opioid formulation. This study provides important clinical information to physicians regarding what can be expected when converting opioid-experienced patients with chronic moderate-to-severe pain to MSN when using the MSN conversion guide. Successful conversion to MSN using this guide was an attainable goal in approximately half of opioid-experienced patients in this study sample, regardless of prior opioid therapy. Those attaining a successful conversion also showed a clinically significant reduction in pain intensity. Pain intensity at the start of the study did not appear to influence successful conversion to opioid therapy. The MSN conversion guide was found to be a safe and useful tool to assist the clinician when converting an opioid-experienced patient to MSN. This study was sponsored by King Pharmaceuticals, Inc., which was acquired by Pfizer Inc in March 2011. King Pharmaceuticals, Inc. was responsible for the protocol development, study conduct, and original analysis. The final analyses and development of the clinical study report was sponsored by Pfizer Inc. Medical writing support was provided by David Lickorish, PhD, and Vardit Dror, PhD, of Engage Scientific Solutions and was funded by Pfizer Inc.
Carl L Roland, Glenn C Pixton, and Veeraindar Goli are employees of Pfizer Inc and were employees of King Pharmaceuticals, Inc. at the time the study was conducted. Beatrice Setnik and Kenneth W Sommerville were employees of Pfizer Inc when this manuscript was drafted and employees of King Pharmaceuticals, Inc. at the time the study was conducted. Robert Berke is the founding partner in a family practice group in western New York State and serves both as a medical consultant to the local county health department and as a geographic assistant professor in the Department of Social and Preventive Medicine, State University of New York at Buffalo, and holds Pfizer stock. Anne Calkins is an employee of the New York Spine & Wellness Center and is a paid speaker for Pfizer Inc. The authors report no other conflicts of interest in this work. Rosenblum A, Marsch LA, Joseph H, Portenoy RK. Opioids and the treatment of chronic pain: controversies, current status, and future directions. Exp Clin Psychopharmacol. 2008;16(5):405–416. Fields HL. The doctor’s dilemma: opiate analgesics and chronic pain. Neuron. 2011;69(4):591–594. Quigley C. Opioid switching to improve pain relief and drug tolerability. Cochrane Database Syst Rev. 2004;3:CD004847. Caudill-Slosberg MA, Schwartz LM, Woloshin S. Office visits and analgesic prescriptions for musculoskeletal pain in US: 1980 vs 2000. Pain. 2004;109(3):514–519. Trescot AM, Helm S, Hansen H, et al. Opioids in the management of chronic non-cancer pain: an update of American Society of the Interventional Pain Physicians (ASIPP) Guidelines. Pain Physician. 2008;11(2 Suppl):S5–S62. Warner EA. Opioids for the treatment of chronic noncancer pain. Am J Med. 2012;125(12):1155–1161. Slatkin NE. Opioid switching and rotation in primary care: implementation and clinical utility. Curr Med Res Opin. 2009;25(9):2133–2150. Knotkova H, Fine PG, Portenoy RK. Opioid rotation: the science and the limitations of the equianalgesic dose table. J Pain Symptom Manage. 2009;38(3):426–439. Chou R, Fanciullo GJ, Fine PG, et al; American Pain Society-American Academy of Pain Medicine Opioids Guidelines Panel. Clinical guidelines for the use of chronic opioid therapy in chronic noncancer pain. J Pain. 2009;10(2):13–30. Nalamachu SR. Opioid rotation in clinical practice. Adv Ther. 2012; 29(10):849–863. Webster LR, Brewer R, Morris D, Cleveland JM, Setnik B. Opioid titration and conversion in patients receiving morphine sulfate and naltrexone hydrochloride extended release capsules. Postgrad Med. 2011;123(5):155–164. Fine PG, Portenoy RK. Establishing “best practices” for opioid rotation: conclusions of an expert panel. J Pain Symptom Manage. 2009;38(3):418–425. Vissers KC, Besse K, Hans G, Devulder J, Morlion B. Opioid rotation in the management of chronic pain: where is the evidence? Pain Pract. 2010;10(2):85–93. 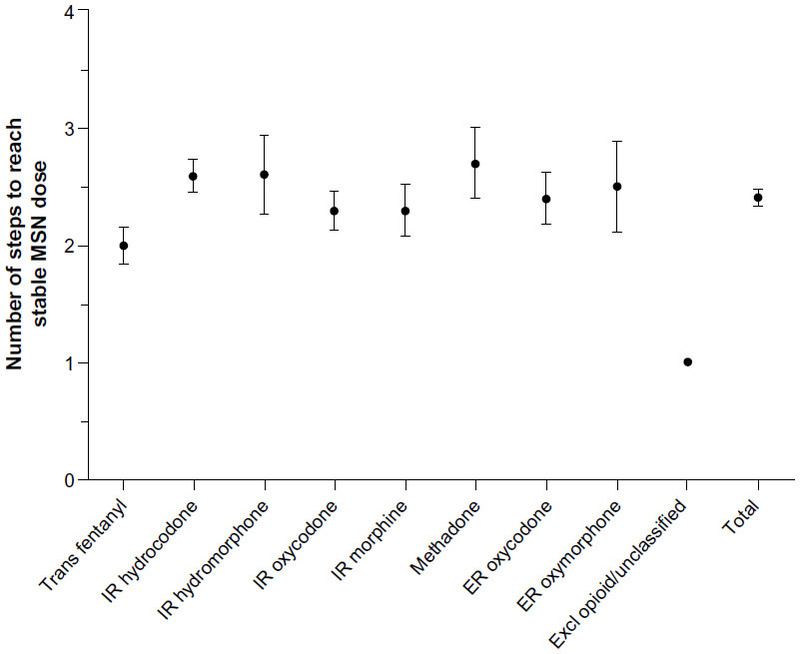 Anderson R, Saiers JH, Abram S, Schlicht C. Accuracy in equianalgesic dosing. Conversion dilemmas. J Pain Symptom Manage. 2001;21(5):397–406. Pereira J, Lawlor P, Vigano A, Dorgan M, Bruera E. Equianalgesic dose ratios for opioids. A critical review and proposals for long-term dosing. J Pain Symptom Manage. 2001;22(2):672–687. Shaheen PE, Walsh D, Lasheen W, Davis MP, Lagman RL. Opioid equianalgesic tables: are they all equally dangerous? J Pain Symptom Manage. 2009;38(3):409–417. Katz N, Sun S, Johnson F, Stauffer J. ALO-01 (morphine sulfate and naltrexone hydrochloride) extended-release capsules in the treatment of chronic pain of osteoarthritis of the hip or knee: pharmacokinetics, efficacy, and safety. J Pain. 2010;11(4):303–311. EMBEDA® (morphine sulfate and naltrexone hydrochloride) [package insert]. Bristol, TN: Pfizer Inc; 2009. American Pain Society. Principles of Analgesic Use in the Treatment of Acute Pain and Cancer Pain. 5th ed. Glenview, IL: American Pain Society; 2003. Gordon DB, Stevenson KK, Griffie J, Muchka S, Rapp C, Ford-Roberts K. Opioid equianalgesic calculations. J Palliat Med. 1999;2(2):209–218. Sloan P, Slatkin N, Ahdieh H. Effectiveness and safety of oral extended-release oxymorphone for the treatment of cancer pain: a pilot study. Support Care Cancer. 2005;13(1):57–65. Levy MH. Pharmacologic treatment of cancer pain. N Engl J Med. 1996;335(15):1124–1132. Weschules DJ, Bain KT. A systematic review of opioid conversion ratios used with methadone for the treatment of pain. Pain Med. 2008;9(5):595–612. Moryl N, Santiago-Palma J, Kornick C, et al. Pitfalls of opioid rotation: substituting another opioid for methadone in patients with cancer pain. Pain. 2002;96(3):325–328. Lawlor PG, Turner KS, Hanson J, Bruera ED. Dose ratio between morphine and methadone in patients with cancer pain: a retrospective study. Cancer. 1998;82(6):1167–1173. Ashby MA, Martin P, Jackson KA. Opioid substitution to reduce adverse effects in cancer pain management. Med J Aust. 1999;170(2):68–71. de Stoutz ND, Bruera E, Suarez-Almazor M. Opioid rotation for toxicity reduction in terminal cancer patients. J Pain Symptom Manage. 1995;10(5):378–384. Maddocks I, Somogyi A, Abbott F, Hayball P, Parker D. Attenuation of morphine-induced delirium in palliative care by substitution with infusion of oxycodone. J Pain Symptom Manage. 1996;12(3):182–189. Mercadante S, Ferrera P, Villari P, Casuccio A, Intravaia G, Mangione S. Frequency, indications, outcomes, and predictive factors of opioid switching in an acute palliative care unit. J Pain Symptom Manage. 2009;37(4):632–641. Grilo RM, Bertin P, Scotto di Fazano C, et al. Opioid rotation in the treatment of joint pain. A review of 67 cases. Joint Bone Spine. 2002;69(5):491–494. Quang-Cantagrel ND, Wallace MS, Magnuson SK. Opioid substitution to improve the effectiveness of chronic noncancer pain control: a chart review. Anesth Analg. 2000;90(4):933–937. Roland CL, Setnik B, Cleveland JM, Brown DA. Clinical outcomes during opioid titration following initiation with or conversion to Remoxy®, an extended-release formulation of oxycodone. Postgrad Med. 2011;123(4):148–159. Brown J, Setnik B, Lee K, et al. Effectiveness and safety of morphine sulfate extended-release capsules in patients with chronic, moderate-to-severe pain in a primary care setting. J Pain Res. 2011;4:373–384. McCarberg BH, Billington R. Consequences of neuropathic pain: quality-of-life issues and associated costs. Am J Manag Care. 2006; 12(9 Suppl):S263–S268. Badalamenti VC, Buckley JW, Smith ET. Safety of EMBEDA (morphine sulfate and naltrexone hydrochloride) extended-release capsules: review of postmarketing adverse events during the first year. J Opioid Manag. 2012;8(2):115–125. Setnik B, Goli V, Levy-Cooperman N, Mills C, Shram M, Smith I. Assessing the subjective and physiological effects of intranasally administered crushed extended-release morphine formulations with and without a sequestered naltrexone core in recreational opioid users. Pain Res Manag. 2013;18(4):e55–e62. Setnik B, Sommerville K, Goli V, Han L, Webster LR. Assessment of pharmacodynamic effects following oral administration of crushed morphine sulfate and naltrexone hydrochloride extended-release capsules compared with crushed morphine sulfate controlled-release tablets and placebo in nondependent recreational opioid users. Pain Med. 2013;14(8):1173–1186. Stauffer J, Setnik B, Sokolowska M, Romach M, Johnson F, Sellers E. Subjective effects and safety of whole and tampered morphine sulfate and naltrexone hydrochloride (ALO-01) extended-release capsules versus morphine solution and placebo in experienced non-dependent opioid users: a randomized, double-blind, placebo-controlled, crossover study. Clin Drug Investig. 2009;29(12):777–790. Webster LR, Johnson FK, Stauffer J, Setnik B, Ciric S. Impact of intravenous naltrexone on intravenous morphine-induced high, drug liking, and euphoric effects in experienced, nondependent male opioid users. Drugs R D. 2011;11(3):259–275. Jang DH, Rohe JC, Hoffman RS, Nelson LS. Severe opioid withdrawal due to misuse of new combined morphine and naltrexone product (Embeda). Ann Emerg Med. 2010;55(3):303–304. Ruan X, Chen T, Gudin J, Couch JP, Chiravuri S. Acute opioid withdrawal precipitated by ingestion of crushed embeda (morphine extended release with sequestered naltrexone): case report and the focused review of the literature. J Opioid Manag. 2010;6(4):300–303. Determine the total daily dose of the prior opioid. Calculate the conversion of the total daily dose of the prior opioid therapy into the equianalgesic dose of morphine using the appropriate ratio (based on the conversion factor provided in Table S1). Note: In general, it is safest to give half of the estimated daily morphine demand as the initial dose and to manage inadequate analgesia by supplementation with IR morphine. Determine the total daily dose of transdermal fentanyl. Note that fentanyl is approximately 50 to 150 times more potent than morphine. Calculate the conversion of the total daily dose of the current transdermal fentanyl therapy into the equianalgesic dose of morphine, using the appropriate ratio (based on an approximate equianalgesic ratio of 10:1 for 10 μg fentanyl to 1 mg morphine comparison; Table S2). Embeda [package insert]. Bristol, TN: King Pharmaceuticals, Inc.; 2009. Duragesic [package insert]. Titusville, NJ: Ortho-McNeil-Janssen Pharmaceuticals Inc.; 2008. Baumann TJ, Strickland J. Pain management. In: DiPiro JT, Talbert RL, Yee GC, Matzke GR, Wells BG, Posey LM, editors. Pharmacotherapy: A Pathophysiologic Approach. 7th ed. New York, NY: McGraw-Hill Medical; 2008:989–1003. Smith AP, Lee NM, Loh HH. Opioid analgesics and antagonists. In: Munson PL, Mueller RA, Breese GR, editors. Principles of Pharmacology: Basic Concepts and Clinical Applications. New York, NY: Chapman and Hall; 1995:399–416. McCaffery M, Pasero C. Pain: Clinical Manual. 2nd ed. St Louis, MO: Mosby; 1999:241–243. Dilaudid [package insert]. Stamford, CT: Purdue Pharma LP; 2008. Dolophine hydrochloride [package insert]. Columbus, OH: Roxane Laboratories Inc.; 2009. Twycross RG. Opioids. In: Wall PD, Melzack R, editors. Textbook of Pain. London, England: Churchill Livingstone; 1994:943–962. Hanks G, Cherny NI, Fallon M. Opioid analgesic therapy. In: Doyle D, Hanks G, Cherny NI, Calman K, editors. Oxford Textbook of Palliative Medicine. 3rd ed. New York, NY: Oxford University Press; 2004:316–341. OxyContin [package insert]. Stamford, CT: Purdue Pharma LP; 2007. Opana ER [package insert]. Chadds Ford, PA: Endo Pharmaceuticals Inc.; 2008.